We havn’t seen much from Skilsaw over the last few years, but it looks like that just might change. Not only does Skilsaw have a new logo, but they say they are building on their past heritage and are expanding their line of professional grade power tools. One of their first new tools is the Skilsaw 10-1/4” Worm Drive (SPT70WM-22) aka the "Sawsquatch". The new 10-1/4” worm drive saw was designed to cut through 4x material easily in one pass; all thanks to the 15-amp motor and the larger 3-11/16” cutting capacity at 90°. "From fence posts to framing to rip or cross cutting, a 10-1/4 inch worm drive will get the job done more efficiently with fewer and faster cuts. It powers through all types of materials and allows users to be more productive on the jobsite." said Angela Tedesco, product manager, circular saws. Skilsaw says they were able to increase the durability of the saw by using a unique copper winding pattern that increases surface area to allow for a cooler running motor. Skilsaw used magnesium components in the saw to increase its overall durability while at the same time decreasing the weight of the saw. 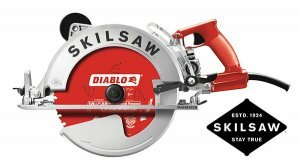 Suggested retail price for the Skilsaw 10-1/4 inch Worm Drive Saw SPT70WM-22 is $449, which includes a Freud Diablo 40T carbide blade. It also comes with the Stay True Guarantee, which allows professionals 180 days to test out the Skilsaw 10-1/4 inch Worm Drive and receive a full refund on the saw if not satisfied.